From building chests of drawers, bird houses or bookshelves, woodworking is a creative and enjoyable hobby that is also practical. Woodworking offers a variety of options when it comes to joining two pieces of wood together. Whether you choose nails or screws depends on the woodworking project and the type of wood used. Explore your options for holding wood together and choose what is best for your woodworking needs. Nails work best for joining a thin piece of wood to a thicker piece. Generally, the nail should be three times as long as the thickness of the wood that it needs to hold together. For a nail to hold wood together effectively, it should be driven into the thin piece of wood first, then the thicker piece. This method allows for two-thirds of the nail to rest in the thicker piece of wood, resulting in a stronger bind. Bending the flat end of the nail down also results in a better hold, however, it is not as aesthetically appealing. Screws provide a strong, clean bond for woodworking. They are easier to remove than nails and tend to damage a project less in removal. Screws can be used for all types of wood bonding and are easier to control than nails. Screwing a screw in place provides less of an impact on your woodworking project than hammering a nail. 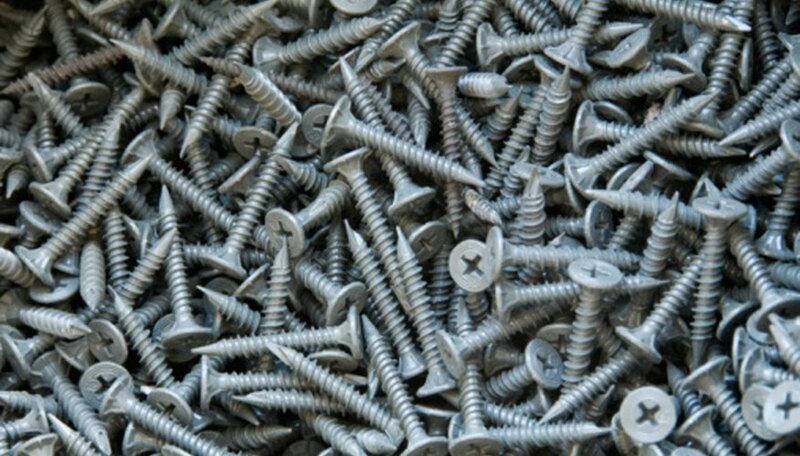 Screws come in a variety of shapes and sizes. Use a screw appropriate for the type of wood used and the project. Woodworking glue is another option for holding wood together. Glue does not provide as tight of a bond as nails or screws, but it is easy and quick to use. Small woodworking projects such as bird houses or picture frames are ideal for using wood glue. To use, spread a thin layer of wood glue on both pieces of wood that you wish to join and allow to dry for three to four hours before sanding or finishing. A biscuit joiner is a small, thin, football-shaped piece of wood used to hold two pieces of wood together. Biscuit joiners do not rust or corrode as screws and nails do, so they are generally used in fine pieces of furniture. To use a biscuit joiner, two crescent-shaped holes or “mouths” are cut into the two pieces of wood using a circular saw blade. The biscuit joiner is then inserted into each mouth to provide a sturdy hold between the two pieces of wood. What Is a Bench Vice?